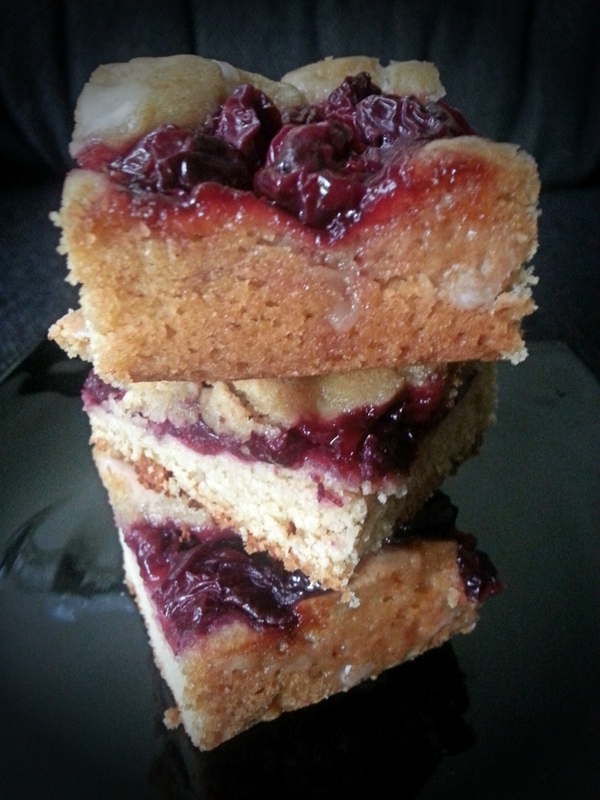 I have never made a pie and to be very honest I don’t feel very confident in making one but one day I definitely will try, so when I was going through different blogs I came across these cherry pie bars and I knew I had to make these, I was so excited that I will be making a pie in a bar form (how cool is that).These bars are insanely delicious and so perfect for summers, the original recipe uses a shop bought pie filling but as we don’t get any here I made my own filling it was really simple and my whole family loved it. The bars are so full of flavour, the base is almond flavoured its like a cookie and then you have the cherry filling topped with more batter and baked to perfection with a vanilla almond flavoured glaze. All in all an amazing recipe that is quick and so delicious and perfect for summers. Preheat the oven to a 180 degree centigrade. Butter a 13 by 9 inch baking dish. In a large bowl mix together flour, baking powder and salt. Set side. In another large bowl with a hand held mixer whip together butter and sugar until pale and fluffy now add in the eggs one at a time then blend in the vanilla and almond extracts. Slowly add in the dry ingredients and mix until well combined. Reserve and set aside 1 1/2 cups batter then spread the remaining batter evenly into prepared baking dish. Top with cherry pie filling spreading into an even layer( if you don’t have a ready made cherry pie filling just take 4 1/2 cups of cherries then put them in a non stick pan with 1 cup of castor sugar and let it simmer on low heat for a couple of minutes the cherries will turn glossy and lose considerable juice remove from heat and add 2 tbsp of cornstarch return mixture to the stove and cook over low heat until thickened stirring frequently, I did not let it get too thick as I wanted it to have its juices running around). Dollop spoonfuls of remaining batter evenly over the top, bake in the preheated oven for 30-37 minutes. Remove from the oven and let it cool completely on a wire rack. For the glaze- in a small bowl whisk together all the glaze ingredients adding enough half and half to reach the desired consistency. 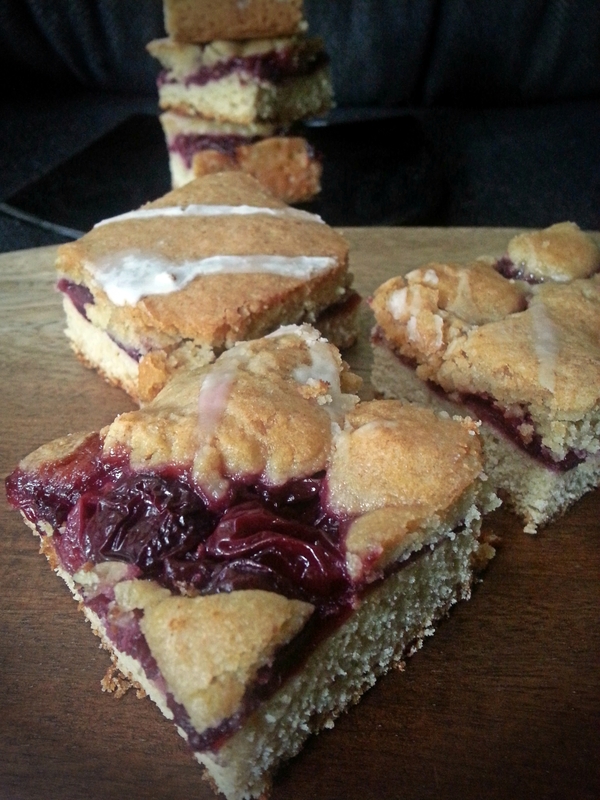 Pour into a small resealable bag and cut a small tip from one corner, then drizzle all over the top of the cherry bars. Let the glaze set in a few minutes then cut into squares. Yes and thank you so much. Maulshri, my all time favorite flavor combination is cherry and almond. I can’t wait to give your recipe a try. I bet your whole family did love them!